SXSW 2011: Sharon Van Etten, Live In Concert You had to get up pretty early in the morning to catch Van Etten play this solo acoustic set on the first day at SXSW. Luckily, KUT in Austin was there to record. Hear one of 2010's breakout artists perform four stripped-down songs from her album, Epic. 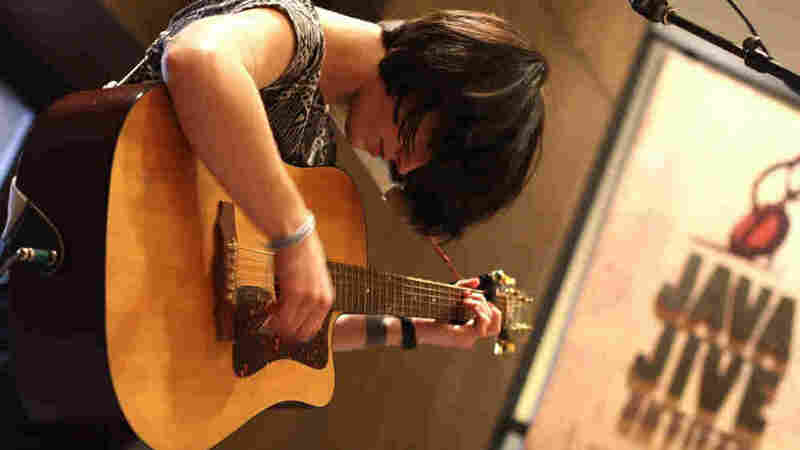 Sharon Van Etten performs an early-morning set at SXSW, live on KUT. SXSW is one of the few places you get to see rock shows during breakfast. Sharon Van Etten's outstanding 2010 album Epic goes great with mornings, so the New York songwriter was an obvious pick for KUT's early broadcasts from the Hilton in downtown Austin. Those who woke up in time were treated to four stripped-down songs from Epic; Van Etten performed a solo acoustic set for the radio on Wednesday morning and saved her more raucous full-band material for later that evening at the Brooklyn Vegan showcase. The session was recorded and mixed by KUT's John Craig and Seph Price, and produced by KUT host Matt Reilly.